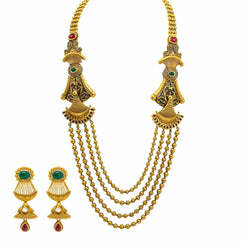 22K Yellow Gold Temple Necklace & Earrings Set W/ Rubies, Emeralds, Kundan, Mango Accents & Large Pear Shaped Pendants for women. 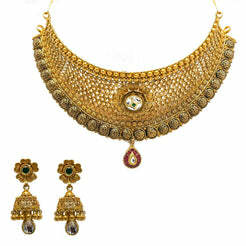 Dare to dazzle with this royal display. 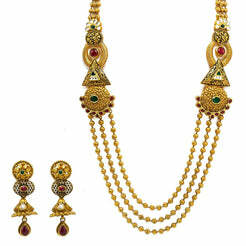 This 22K yellow gold Temple necklace and earrings set is embellished with precious rubies, emeralds and kundan. Its unique design features a lining of textured mango accents and large pear shaped pendants. The necklace is 16 inches long with a width range of 2.25-19 mm. Its pendant is 87 mm long and 48 mm wide. Each drop earring is 56.5 mm long and 22 mm wide. 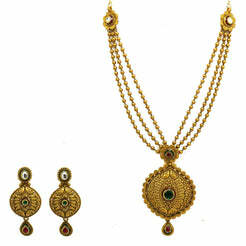 This decadent set has a total gold weight of 85.1 grams.